Welcome to Fairfield Farm! Charlie and Donna Sasscer purchased Fairfield Farm just before they got married in 1989. During their engagement, Donna and Charlie spent many hours looking for a farm they could afford. They looked in Virginia, the Eastern Shore and throughout Southern Maryland. Because they wanted to stay close to their families, they purchased 48 acres in Park Hall, Maryland. It was a raw piece of land that has taken many years to become a viable farm operation and family home (which began as a room over the garage until they could afford to build their home 5 years later). Charlie and Donna both have strong roots in the Southern Maryland agriculture community. Charlie was born and raised in Upper Marlboro, Maryland. Donna was born and raised near LaPlata, Maryland. Charlie and Donna are 4th generation farmers. They are pleased that their children Shelby and Charlie, III are now 5th generation farmers. Fairfield Farm is owned and operated by the Sasscer family: Charlie, Donna, Shelby and Charlie, III. 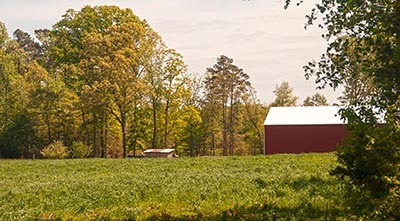 The family's farming operation consists of 295 owned and leased acres. On the home farm the family raises beef cattle, boer goats, sheep, hogs and a small flock of laying hens. The family also raises hay for the local horse industry. Charlie divides his time between farming and operating his own home improvement company, Landmark Restorations. Donna works full time outside of the house. Shelby is now a full time nurse at MEDStar St. Mary's. She recently purchased her own small farm in Leonardtown. She will be relocating her goat operation to her farm. Shelby currently works for Shlagel Farms on Saturdays to sell their delicious strawberries as well as other fresh fruits and vegetables at the Home Grown Farm Market. Shelby also sells her own baked goods, jams and jellies at the Home Grown Farm Market. During the holiday season she makes Christmas wreaths out of fresh cut Leland Cypress. Charlie III will be a senior at OSU. This summer he will be doing an internship at Black Leg Ranch in North Dakota. Charlie supports the Home Grown Farm Market with firewood and eggs. Fairfield Farm has been successful in obtaining its on-farm food processors license. Currently our pork products are being sold at Keep It Local in Morganza, the Home Grown Farm Market in Lexington Park, Spider Hall Farm in Prince Frederick, and Chesapeake's Bounty in St. Leonard.